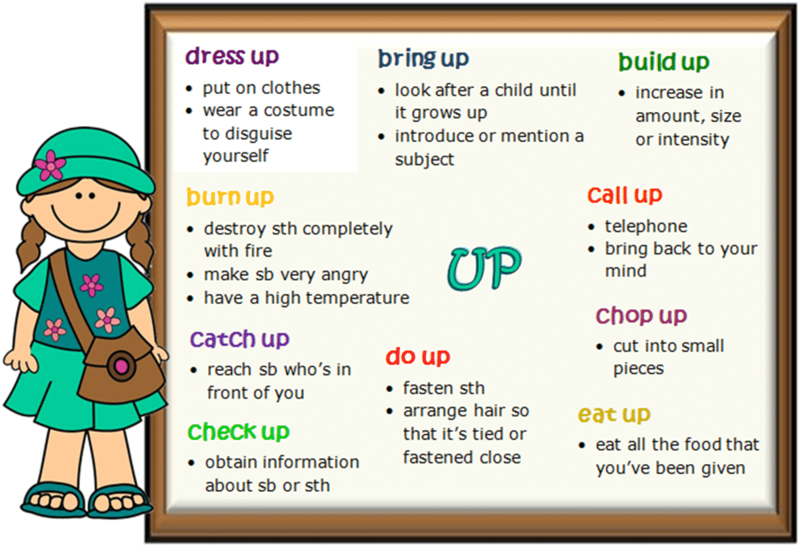 Learn Useful Phrasal Verbs with UP in English with Meaning and Examples. A phrasal verb is a verb that is made up of a main verb together with an adverb or a preposition, or both. Blow up(explode): The car blew up after it crashed into the wall. Break up(End a romantic relationship): Eva and her boyfriend broke up last week. Bring up(Look after a child until it grows up, usually children): They brough their children up to be responsible adults. Bring up(Introduce or mention a subject): Bring it up at the meeting! Build up(Increase over time): It’s important to build your muscle strength up over time. Burn up(Destroy something completely with fire): The spacecraft burned up as it entered the earth’s atmosphere. Burn up(Make somebody very angry): The way he treats me really burns me up. Burn up(Have a high temperature): You’re burning up—have you seen a doctor? Call up(Telephone): I’m going to call up and cancel my subscription. Call up(Bring back to your mind): The smell of the sea called up memories of her childhood. Catch up(Reach somebody who’s in front of you): Go on ahead. I’ll catch up with you. Catch up(To reach the same level or standard as somebody who was better or more advanced): After missing a term through illness he had to work hard to catch up with the others. Catch up(To do something that you have not been able to do recently): Recently, I’ve had a lot of science homework. This weekend, I need to catch up on my reading for English class. Check up(To make sure that somebody is doing what they should be doing): My parents are always checking upon me. Check up(Obtain information about somebody or something to find out if something is true or correct): I need to check up on a few things before I can decide. Cheer up(To make someone happier): Can you cheer Tim up? Chop up(Cut into small pieces): Can you chop up some carrots for me? Divide up(Distribute): We can divide up the commission among the sales staff. Divide up(Force up the prices or costs): The uncertainty in the markets is dividing up labour costs. Do up(Fasten up): Do you know how to do up your seat belt? Do up(Arrange hair so that it’s tied or fastened close): Although be when do up one’s hair, drop a lot of hairs accordingly, also cannot explain you begin bald-headed. Do up(To repair and decorate a house, etc. ): He makes money by buying old houses and doing them up. Dress up(To wear a fancy dress, a costume to disguise yourself): He dressed up as a pirate, for the party. Dress up(Put on clothes): There’s no need to dress up—come as you are. Eat up(To eat all the food that you’ve been given): If you eat up all your vegetables, you can have dessert. End up(Eventually do/decide): We ended up going to the theatre instead of the gallery. Get up(Get out of bed): I got up early this morning and went for a walk. Give up(To abandon to do something/To stop doing something): Time to give up! Go up(To increase): The price of gas went up in March. Grow up(To become an adult): I’m 18, I’m a grown-up now! Heat up(To make hotter): I’ll heat the soup up for lunch. Hurry up(To do something faster, to get ready faster): Could you please hurry up?! Keep up(Continue at the same rate): Slow down! I can’t keep up. Liven up(To make something more fun): Let’s liven this party up with a game. Look up(Find, search for): Did you look up the telephone number of the restaurant? Make up(Invent, lie about something): Don’t believe everything she tells you. She likes making up stories. Meet up(Make an arrangement to meet): What time should we meet up on Wednesday? Open up(Start to talk freely about something): She hates to open up and discuss her feelings. Pass up(To not take an opportunity): We can’t pass up this chance of increasing productivity. Pick up(To improve over time): My health has picked up over the past few days. Put up(To raise): We’ll have to put our prices up to compete. Set up(Arrange): I’ll help you set up for the party as soon as I get home. Show up(Arrive): You can rely on Jim to show up on time. Speak up(To speak with a stronger voice): You need to speak up for people to understand you. Speed up(To go faster in a vehicle): He quickly sped up to sixty miles an hour. Stand up(To be on your feet): There were no seats left so I had to stand up. Start up (to start something new): They’ve started up a new division in Southern Europe. Take up(Start): Have you taken up any new hobbies lately? Turn up(To raise the volume): I like to turn the stereo up when nobody is home. Warm up(To make hotter): I’ll warm this soup up for lunch. Write up(Write a report or minutes): It’ll take him at least a week to write up his findings. Back up(Cause to move backward): You can back up another two feet or so. Back up(Support or help someone): The rebels backed up their demands with threats. Draw up(Prepare a written document): They agreed to draw up a formal agreement. Draw up(If a vehicle draws up, it arrives and stops): The cab drew up outside the house. Fix up(Repair): They fixed up the house before they moved in.